The November 6 election results in California were a disaster no matter what way you look at it. For Republicans, it reaffirmed that we are on the wrong track, that our messaging is severely amiss. For Californians generally, their choice has been whittled down to a single party, a party that does not resemble anything the Founding Fathers would recognize. Democrats now hold every Statewide Constructional office, and a Super-Super Majority (not a typo) in the Assembly and State Senate, and we, the Republican Party need to undertake a critical analysis of how we operate; critical triage of just what it is that needs to be addressed. Without understanding where we are and how we came to be in this situation, 2020 will be a further decline of our once great CRP, if that is even conceivable. 1. Voter Registration. Since March, 2013, the California Republican Party has not spent a dime for voter registration and in fact has a policy against registering voters. What does this mean? In January 2013 there were one million more registrants than Decline to State. As at October 22, 2018, Decline to State show 700,000 more registrants than the GOP. 2. Get Out the Vote. In 2016 the Democrats passed a bill to allow harvesting of absentee ballots. In 2018 the Democrats did this, and the Republicans ignored the new law. As a result Democrats received 580,000 more absentee ballots than Republicans. 3. Communication. Communication is a key component of the plan to register voters and to earn votes for our candidates. I give dozens of speeches each year all over California – from San Diego to Humboldt and I have been doing this for more than twenty years. 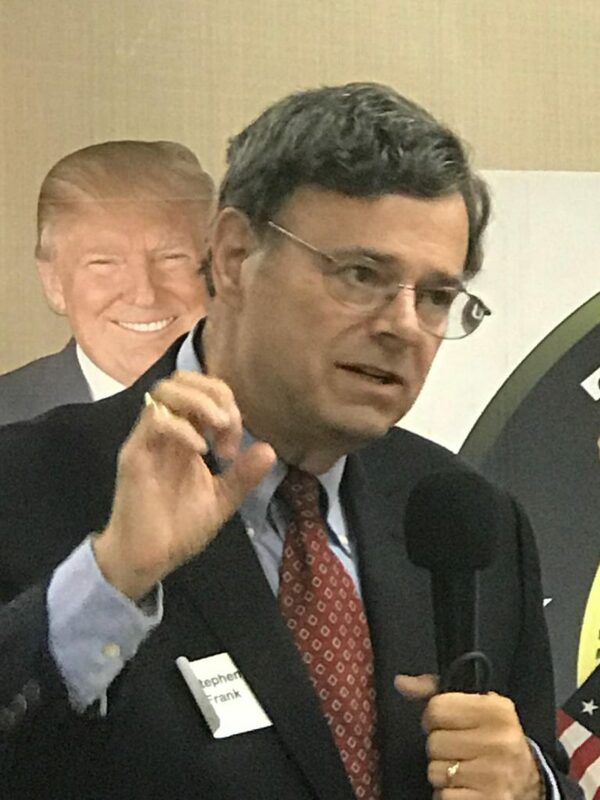 I publish the California Political News and Views, six days a week, which I began in 1996 and many of you hear me each week on numerous talk radio shows around the State. As a Party we need to promote our values and principles to the general public, not just GOP groups. 4. Permanent Coalitions. We need to have permanent coalitions created by the State party, not just temporary ones promoted by candidates which end at after the General Election. Establishing these coalitions needs to be a priority and they need to be nurtured and managed. 5. Strengthen County Committees. The Republican Party in California must no longer be a top down operation, where the CRP tells candidates and local committees what to do, how to do it and what they must do to ‘qualify’ for assistance. We need to have a genuine partnership between all elements of the CRP team, including coalitions, County Central Committees, and volunteer groups. Specifically, we need to help each other in raising money, voter registration, training, development of coalitions, recruiting candidates and growing our volunteer base . 6. Re-energizing of Volunteer Clubs. We need to invigorate and bring into the CRP family many chartered clubs and independent Republican clubs. A particular focus must be on reaching out to college republicans to show them we value their commitment and ideas. Hence, we need to embrace a strong training program and establish regular regional meeting to better communicate with the grassroots. It is they, if we are genuine with our time and effort that will be our ‘army’ on the ground on election day. An expansion of all these ideas can be found in my ‘Back to Basics Plan. Cooperation between the stakeholders, with no one stakeholders controlling the other is paramount if we are to turn our party in California around. We need all parties including donors, legislators and the grassroots to work together. The current model has failed us, and we must develop a comprehensive plan if we are to encourage our donors to come on board again. As with any investment opportunity, those investing need to be able to see how their investment is going to reap the rewards they expect. My Back to Basics plan provides this roadmap. We need solutions, not just a recitation of the problems. We need a Chair that is readily available to all members. My email address is stephenfrank@sbcglobal.net and my cell phone is 805-795-1271 – I will return your call. Want a Chair for All Republicans, please vote for me, Steve Frank, open the California Republican Party to all delegates. Steve Frank is the only candidate for California Republican Party Chair that has been active in the CRP. He has been elected to the Board of Directors by the delegates, served several terms on the Executive Committee and four terms as Parliamentarian. He is the only candidate to serve on CRP Committees, such as Resolutions, Rules and Resolutions. As an activist he give between 50-75 speeches a year around the State, has done this for more than twenty years. For many years he has done 6-9 radio interview shows each week and worked campaigns from San Diego to Del Norte for the past forty years. Steve has also served as State Chair of the Girl Scouts Councils of California, the L.A. Travelers Aid Society and numerous community groups. Starting in 1960 walking precincts for Nixon, office manager for a Goldwater HQ, working Youth for Reagan in 1966, to being Deputy Political Director of Simon for Governor in 2002, Strategist for Jones for Senate and Coalitions Director for Giuliani for President, Steve has been active. Since 1996 has published the California Political News and View. Married 46 years, has two daughters and five grandchildren.